The SpartanNerd spent some time this past weekend at the Toys R Us in Spartanburg, SC, this weekend. I was immediately drawn to the display right at the entrance….a new item, “Lego Nexo Knights.” I don’t know why…I kept coming back to it. I expect it will replace Lego Ninjago and Lego Chima. Or maybe it will be an attempt. There were a wide variety of different things for the new line, but I didn’t want to commit too much…or anything at all. But since I kept coming back, I decided to make a purchase. I purchased “Ultimate Lavaria.” Keep reading for a review of my experience so far! Lavaria came in this little box. Above is what caught my eye, and then there is the backside, showing that there are things that can be done on tablets and phones with the figure. I’m not a Lego collector, and have talked about the price of Minifigures before. But if there is even a CHANCE I am going to get into these, I want to have a system of keeping them organized. So I opened the box carefully from underneath in order to preserve it as a storage space. As expected, there was an instruction book and polybags with the bricks inside. There was also lots of cross-sell for this new line. And here was the parts list. These extra parts. Also, there were some bucks with a long peg that weren’t listed. I went ahead and began assembly. I don’t know why, but I decided to pause here, seven minutes into the build. I took this picture. I think this was right after I put the wings on. Its a pretty ingenious idea, making a backpack out of a two-studded flat piece by adding a part that fits over the neck. The legs here are on a thing that looks like a floating thing from a boat or something. I have seen this design before on Ninjago things. There is al alternate pair of legs, so Lavaria doesn’t have to be on four spider legs. Also, you can turn the head around to get a different expression. I think what caught my attention with Lavaria is the similarity to Darth Maul. The double sided spear. The mechanical spider-legs. It dawned on me that Lavaria is a female! And I was pronouncing it “le-VAIR-EE-ah.” But it must be LAVA-ria. Remember I mentioned the electronic features of Lego Nexo Nights? I have played through the first level, and this character has made no appearance whatsoever. But all of the enemies have some “lava” component to them. The main enemy is named “Jestro,” a cross between the Joker and Destro? How does the toy interact with he game? Remember those different shield that came with Lavaria? The app can scan those, and this adds special moves to your chosen Nexo Knight. (What does “Nexo” mean anyway?) It is notable that choosing “beetle bomb” causes your Nexo Knight to suddenly have the four legs that Lavaria has, only in their color scheme. So maybe she isn’t supposed to always have those spider legs on? The shield shown here is “incinerate.” Basically it makes fire fall out of the sky to burn up your lava enemies? And you can see the Venom attack on this shield. But it looks like there are dozens of moves you could unlock if you collected the whole line. SO was this a good impulse purchase? I’ll admit. Whatever I thought was cool about it in the store has worn off a little. Maybe it’s the simplistic game. Or maybe it was that the kit wasn’t the least bit challenging. Or maybe it is because this is the only thing I have from this set. Not sure. Will I get more? Not sure! I think Lavaria is cool looking. She is pretty fun to play with. She has to get a 4/5. The app has to get a 2/5 for now. So the SpartanNerd Rating of Lego Nexo Knights Ultimate Lavaria is 3/5. Do you agree or disagree, Hub City Geeks? Let me know in the comments! Bored and nearly broke…buying dish detergent and looking for cheap content…I came across this gem for a mere three dollars at Dollar General Market in Pacolet, SC. A couple of things bears discussing here, first. 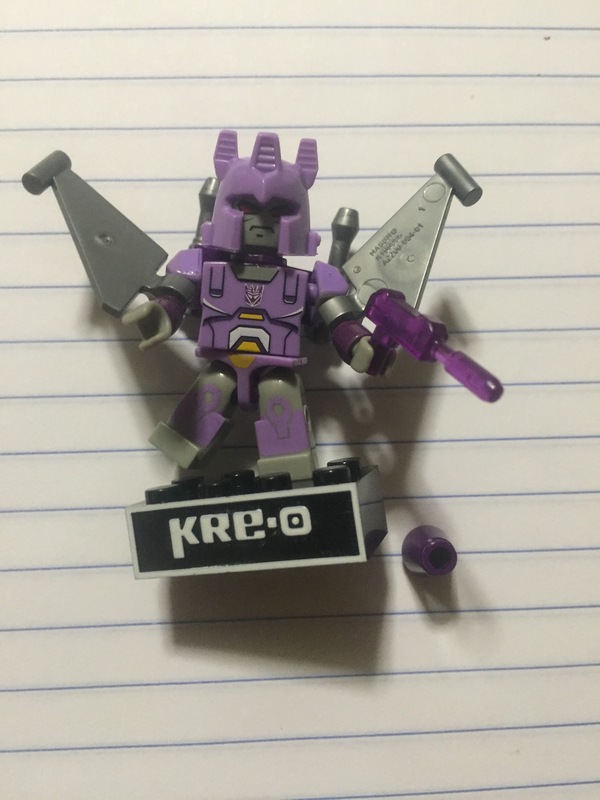 This isn’t my first experience with Kreo Transformers. One of the Spartan-children had a Kreo BumbleBee once. They were really too young. So I had to do the assembling. Which was quite tough. 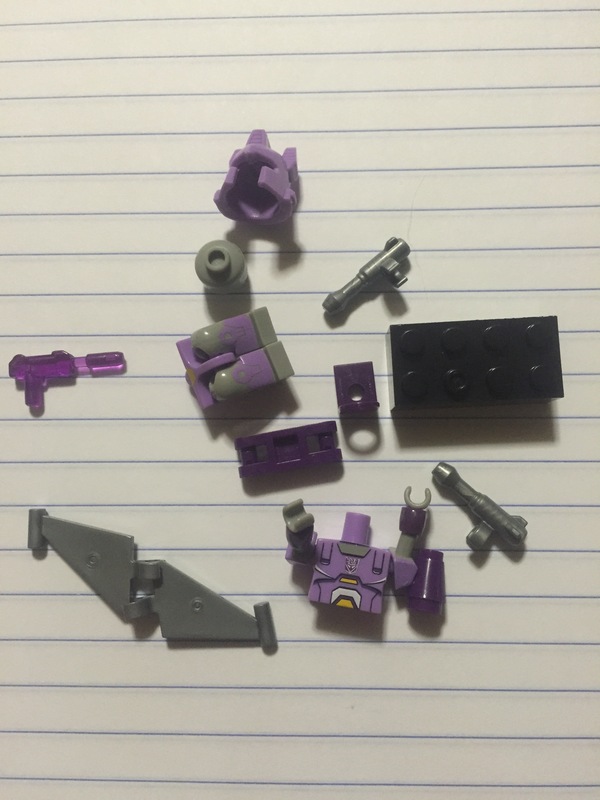 I specifically remember putting pieces on, only to have others let go. Ranking building blocks…LEGO is king. The blocks go tog enter comfortably. There are certain “design standards” that LEGO adheres to. Then there are the iconic Mini-Figures. Mega-Blocks…second place…at one time these felt like generic LEGO blocks. Nowadays a kid might just as well be talking about LEGOs and Mega-Blocks interchangeably. 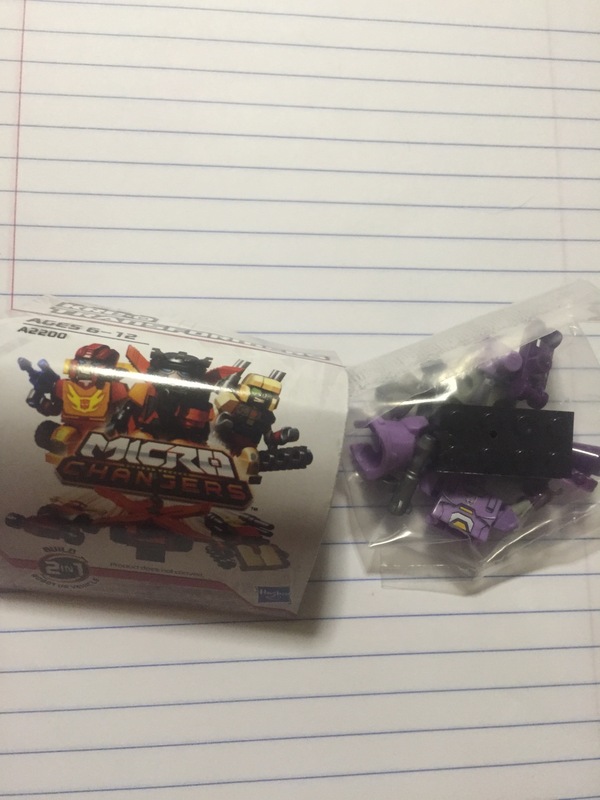 Mega-Blocks has its own figures, and cool licenses such as Halo. They don’t market to as young of a crowd of kids as LEGO. But they don’t have the same design standards as LEGO. So they might just wing a big rectangle on a single stud, and call that a moving part. Not the best our soundest solution. Then KREO has to be last. These blocks are meant to be interchangeable with the other two. But there are some problems. They tend to be smaller. And the studs don’t stick together so well even with blocks in the same set. And forget about design standards…a part might be held together with tension, or whatever. I remember that BumbleBee having layers and layers of underside. This was neither fun to build, and seemed to be lacking in function. When I saw this KREO Transformer, I remembered the BumbleBee experience. 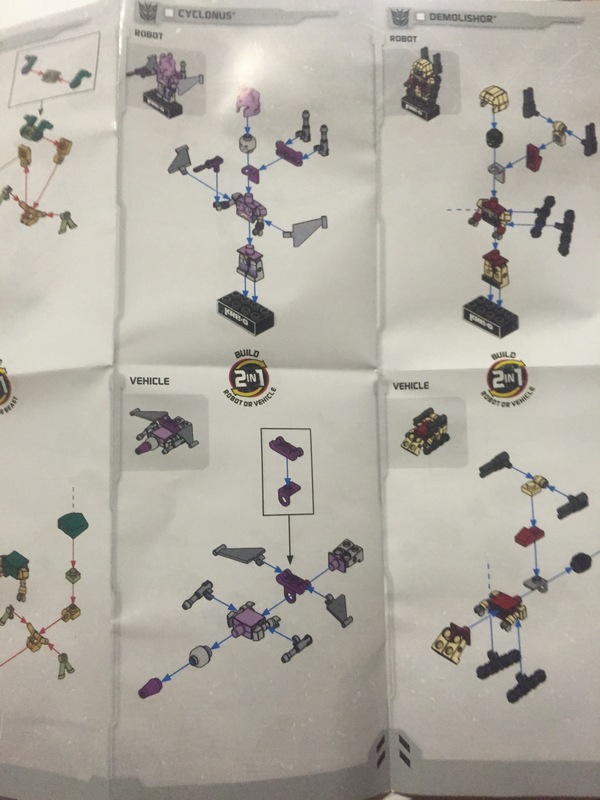 I also know that that particular set was among the first KREO sets. I wondered if things had moved along any and improved? Keep on reading for more of the review! Opening the package revealed these two items…a poly-bag and the instructions. 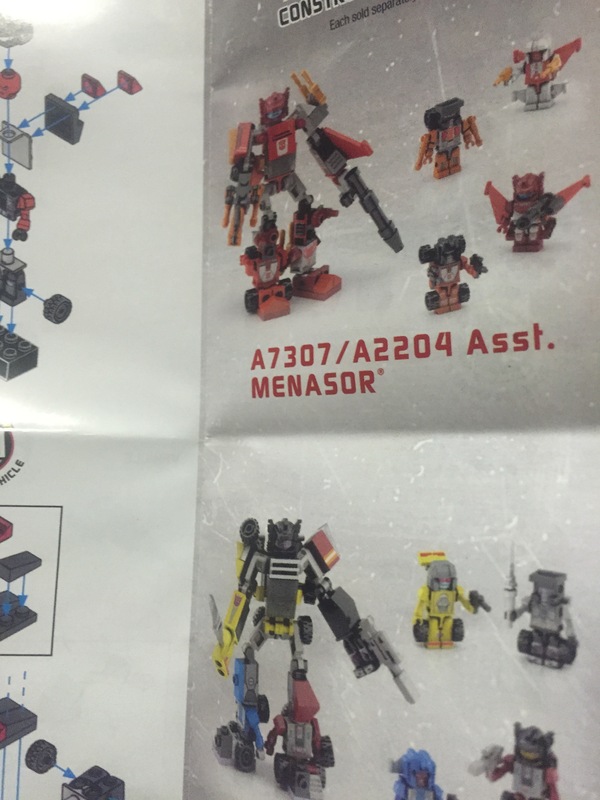 I believe the instructions have an error…The ad for Computron and Menasor are BACKWARDS. Compton is the one at the top. I could be mistaken however, not being that much of an expert on Transformers. 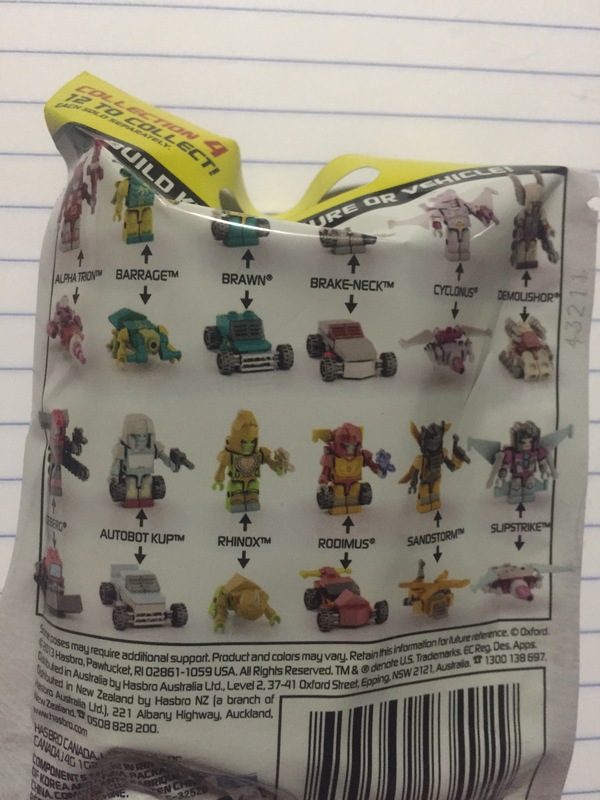 But as a kid, I had Scattershot. Furthermore, I saw a “Combiner Wars” version of Computron at Big Lots. Here are the assorted parts. Here is my first build of Cyclonis. As I look at him, I scour my memory to see if I can remember this character. 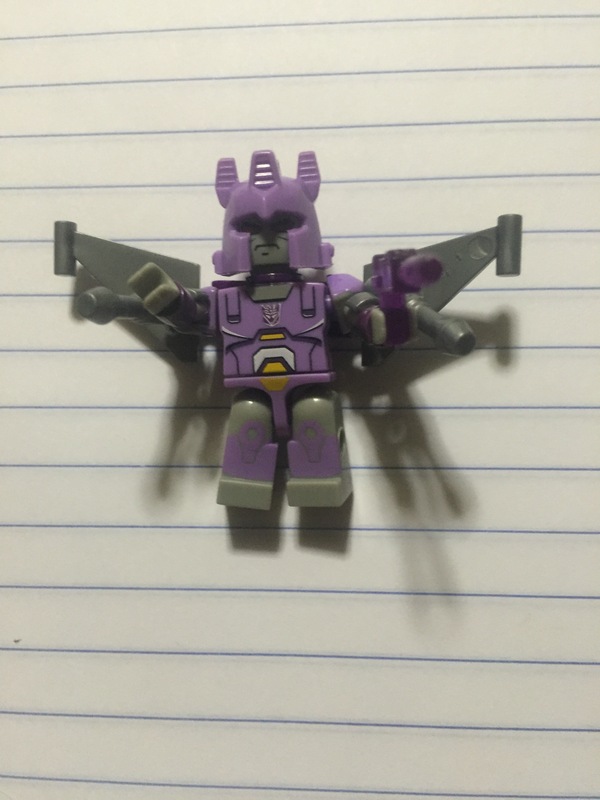 The wings on the arms really bother me. So I re-arranged him to have a more “Starscream” build. One thing that is immediately apparent is the helmet doesn’t want to stay on. He has a head-barrel almost exactly like a LEGO mini figure. But that helmet doesn’t snap on well. And it keeps popping off. After rebuilding him into “Thundercracker” or similar re-colored Starscream, I put him back the way he is supposed to be according to the instructions. 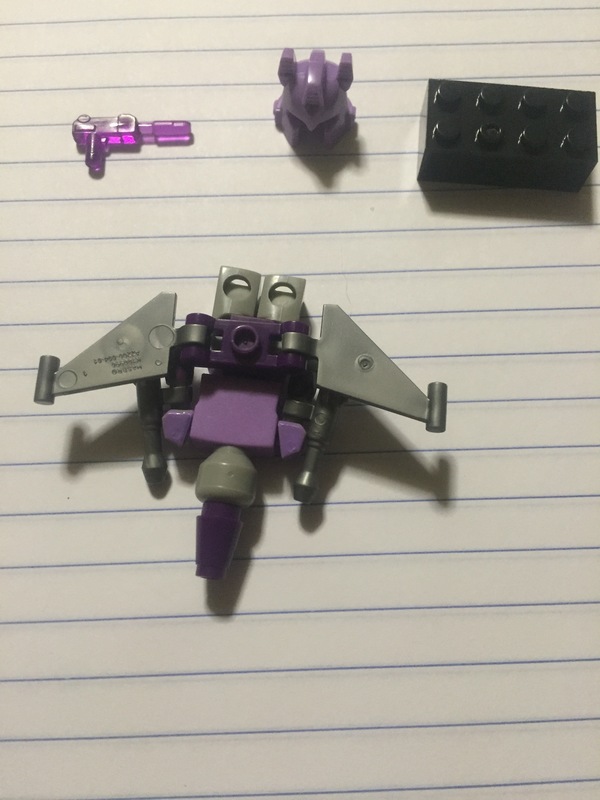 I am certain, however, if there was a Starscream KREO, he would probably have the same pieces with a different coloration. Cyclonis…who was he? The back of the bag tells me that he is probably from the episodes of Transformers I would only OCCASIONALLY watch. I was very upset when they killed off Optimus Prime. I also preferred the Autobot and Deception war to be on Earth, and finally the vehicle modes of the last season of Generation 1 Transformers tended to be science fiction things like ships, futuristic cannons, etc. This made sense for a group of warriors on Cybertron. Finally, It came to me. A little blip in my memory where Galvatron is using Cyclonis name. I broke down and looked at Wikipedia. Indeed, Cyclonis was Galvatron’s “right hand man.” And yes. His wings are on his arms. Transforming Cyclonis wan’t difficult. He becomes one of those “futuristic” vehicles I mentioned. The transformation really isn’t anything more than the figure on its belly, with an extra nosecone piece instead of the helmet. And the wings re-arranged. I much prefer the robot mode! I haven’t reviewed alot of LEGOs. But as it goes, this is worth every bit of three dollars. I really like the color scheme. 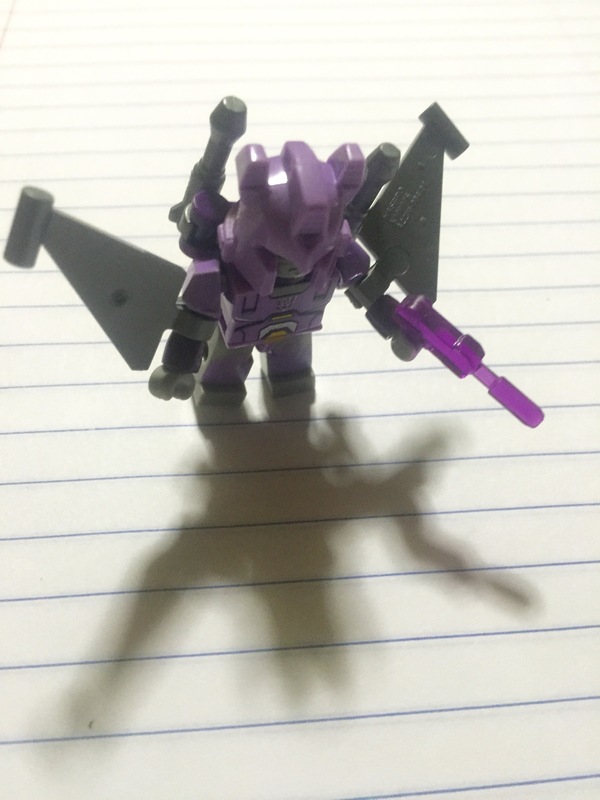 He is menacing, with guns on his back and a purple gun accessory. You immediately know he is a Decepticon! (I have always been more of a Deception, even though I regarded the Autobots as awesome as well. But my toys were usually Decepticon. Sure, it has some problems. The helmet doesn’t like to stick to the single stud on top of his head. He stands better without the stand…both feet don’t want to plug into it. (That’s why you saw me posing him standing on one foot.) There is ugly branding on the underside of one of the wings. 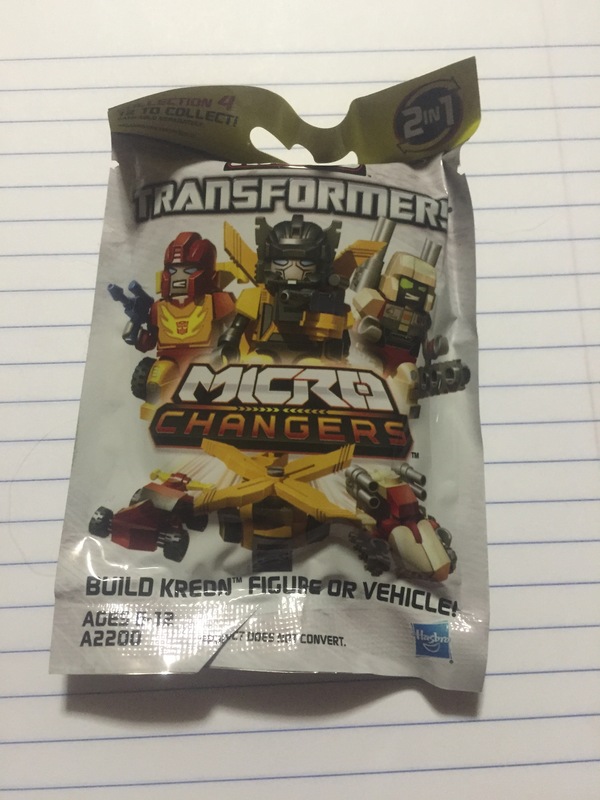 The SpartanNerd rates KREO Transformers “Micro-changers” (Blind Bag) a 4/5. For three dollars,you have something way cooler than most LEGO mini figures that come in blind bags. For instance, I remember SpartanKid opening a Cheerleader, a clown, and a caveman. At least this was a Decepticon!